International students at UNO find a variety of opportunities to help pay for their education. Use the links below to learn about scholarships and funding. 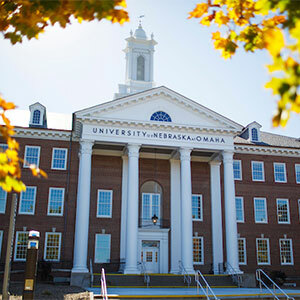 Individual academic departments at UNO offer scholarship opportunities that are open to all students, including international students. Eligibility, selection criteria, amount, and duration vary by department and program. Additionally, graduate students may be eligible to apply for graduate assistantships, which pay stipends for performing teaching or research duties. Check with your department to see what opportunities may be available to you. Many international students choose to study and also have part-time jobs on campus. Employment opportunities are competitive. Check out the campus job postings with UNO Human Resources. International students should use tools such as fastweb to find scholarship opportunities suited for them. Be sure to read eligibility criteria and other guidelines fully before applying. Also check with your home government, whether national or local, for other funding opportunities. Many national governments operate programs to fund a citizen's education abroad, sometimes in exchange for working at home after the completion of studies. Another good place for advice is the nearest EducationUSA Advising Center. Scholarships, graduate assistantships, and jobs are competitive so applicants need to do their best in completing forms and writing essays. Be thorough: Read the application thoroughly before you begin responding to the questions. This will give you a chance to come up with ideas for each section and to make a plan for addressing all of the application criteria. Be neat: Write a rough draft before submitting your scholarship. Grammar, spelling, and overall appearance are important. Whenever possible, type your answers even if it means attaching your responses on separate pieces of paper. A tidy, well organized application will please the reviewers. Focus: Stay focused on the topic of each question. Rambling or straying into other topics will distract the reviewers and give them a negative impression. Shine: The application is the only way the reviewers have to learn about you. This is your time to shine. See this as your opportunity to show the committee who you really are and what you value most. Tell them how your values align with the specific criteria they have asked for. Give it your all: The form should be filled out completely. References to "see resume or statement of purpose" will not be accepted as complete. The application should look like you gave it a lot of effort. Be thoughtful: Unless instructed otherwise, do not feel limited to the space provided on the application form. If you run out of space, include more information on a separate piece of paper. But don't stray off topic. An effective response will answer the question fully and succinctly.